At the Giants-Rockies game at AT&T Park in San Francisco, one fan pulled off what might be the smoothest move in the history of Father's Day. Rockies shortstop Troy Tulowitzki smashes a home run to left field as the father walks out of the tunnel holding his well-shaded baby in his right arm. 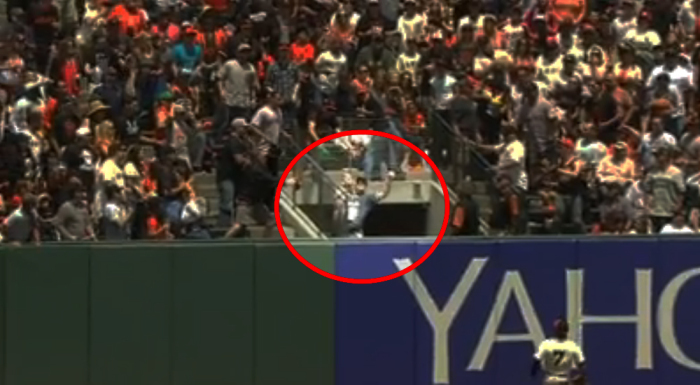 While the fans around him angle to snag the ball, the dad casually reaches up and plucks it out of the air with his left hand and walks back to his seat. No glove, no problem!